This picture shows Ossett's last lamplighter in action somewhere in Ossett before the final conversion to electric street lights. This chap was probably re-setting the clockwork timer, which in those days, turned the gas lamp on and off. There is some disagreement as to whom actually the gentleman is in this picture. My thanks to Jeremy Fisher for contacting me with information that he thinks the picture is of a Mr. Jacques, who used to live in Hillcrest Avenue, Ossett with his wife and daughters in the 1960s. Eileen Barraclough (nee Tyrell) has also contacted me recently and she says that she is pretty certain that the man pictured is actually her father, Wilfred Arthur Tyrell. "Mr. Wilfred Arthur Tyrell was one of Ossett's last lamplighters. Wilfred was born in New Zealand in 1897. He and his five brothers came to England in 1916. Within a few weeks of their arrival they had signed up for the Canterbury Infantry Regiment. The brothers were all wounded during the war, but they all survived. On August 3rd 1925 Wilfred married Gladys May Pilling and together they had four children. At the time of his marriage Wilfred was a tennis racket stringer at Sykes (which became Slazengers). He later worked at one of the local pits at the coal face. In 1949 Wilfred had a small sports shop in Horbury which he gave up when he joined the Gas Board where he became the lamplighter for the area. He was a familiar figure, cycling around the district, carrying his ladder. When he reached 65 Wilfred decided to work another year to add a little extra to his pension. Sadly Wilfred died six months after he retired." The photo was taken at the Wesley Street end of Headlands Avenue, where the Tyrell family moved to in 1949, and their house was about 30 yards from where the picture was taken. Wilfred Tyrell had been a tennis racquet stringer, and later had a sports shop in Horbury. When he gave up the shop he went to work for the Gas Board, maintaining the street lamp and could be seen riding his bike and balancing his ladders, which was very dangerous! Mr. Tyrell's main area of work was South Ossett and the Green. Before the common usage of electricity for lighting, Ossett's streets were lit by gas, and in some places, right up to the 1950s. Gas powered street lights had to be lit at dusk and then turned off again at dawn. In the early days, this onerous task was carried out by lamplighters using long poles to operate the mechanism to switch the lamps on and off. There were still plenty of gas lamps around in the 1950s & 60s, but they were operated by a clockwork timer. 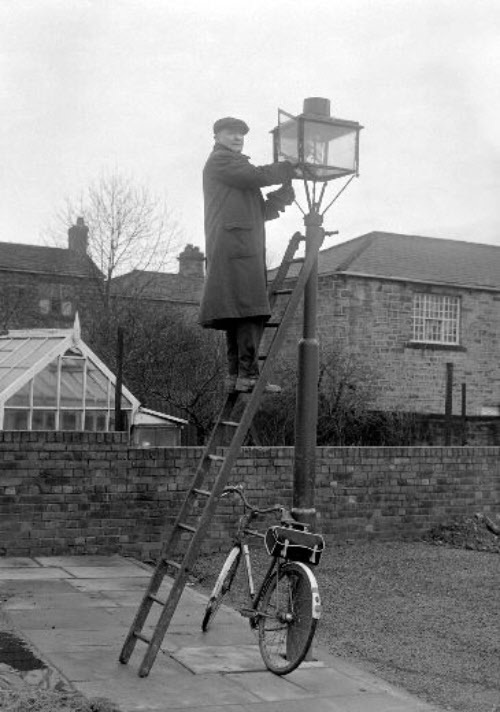 Usually, once a week, the "lamplighter" would come round with a small ladder, lean it against the arms of the lampost then wind and reset the mechanical clockwork timer, wipe the glass clean and carry out any other maintenance that was needed. However, they did not have to light the lamp every night since the clockwork timer did the job automatically.